Many of us take words and how they are used in language for granted today. Personally, I find it thought-provoking to look at the root of a word (etymology) and see if I took for granted its definition. Often I find that I have been confused or outright misunderstood a word, or that it’s meaning has been diluted over time. There is one word that I have been pondering that is often used for one-time acts of valor, abused for marketing impact, has awards associated with it, and has few adherents outside of the warrior profession and arts. The etymology of the word honor pins it circa 1200 AD as French with Latin origin. Glory, renown or fame earned is the Anglo-French honour, or we can look to Latin and find dignity, distinction, position; victory, triumph used by Cicero. I would like to add that if glory, renown, and fame are honorable, then we should assume this honor is achieved with dignity and distinction. The concept of honor arose to distinguish admirable behavior which resulted in a positive long-term benefit to the tribe. Self-serving behavior, acts that belittled or hurt others, laziness or debauchery probably did not pass the muster of being “honourable.” Though this concept seems self-evident, I might point out that in our liberal society, where a value has been reduced to “what makes one feel good,” it is easy to recognize something as “good” without knowing how to “be good.” So is the concept of honor meant to make us feel good about a personal act of courage? Or is it about being good through daily actions? In other words, is honor recognition for a good action with no regard to other actions by said individual, or is honor a way of life? Is a bad person who performs a solitary good deed honorable? Interesting questions. If you have had the pleasure of joining the US Navy, you will recall being hit with the concept of honor the moment you stepped off the bus. It is one of her three core values. Core values are intended to represent the spirit of the organization and mold behavior in its members. Core values are meant to be considered when decisions are made, to be displayed in actions on and off the battlefield, and essentially help the Sailor stay connected to their core when under pressure (which is almost always). The three core values of the Navy are honor, courage, and commitment. These are the same core values that I hold my SEALFIT an Unbeatable Mind teams to. The Congressional Medal of Honor recognizes selfless acts in times of extreme danger which protect teammates and help achieve mission success. This highest award for military members recognizes acts of valor that require honor, courage, and commitment. Dignity, distinction, and triumph are on display in these moments. But the Navy expects that honor is more than a single act of valor. 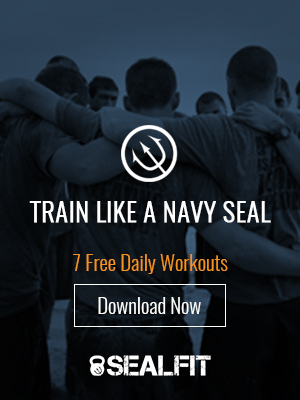 It is an attitude and way of life for the Sailor or SEAL. Consider my former boss Admiral McRaven, who spent 40 years serving his country, literally writing the book on special operations theory and leading the team that brought Bin Laden to justice. The Admiral did not seek fame or glory, but to live with honor, courage, and commitment. And consider the countless other military men and women who show up with commitment, act with courage, and wear the uniform honorably every day, putting their own lives at risk to serve and protect our country. Imagine if this were the norm, rather that the outlier in today’s civilian world? What if we decided it should be so, and we lead the way? So I challenge you to commit to living a life of honor, and courageously strive to fulfill that commitment, day in and day out. Together, we can make a big difference. What have we got to lose?